As our name implies, Holster Builder has everything you need to build our holsters. We are a small veteran-owned company that exists to help your small business succeed, and we believe in the value of hard work. We’re fortunate to live in a day and age where craftsmanship is starting to matter to people again. Rather than settling for something that is cheap, people take the time to look into products that are built by hand and made to stand the test of time. If you are searching for holster making supplies, then you’re in the right place. 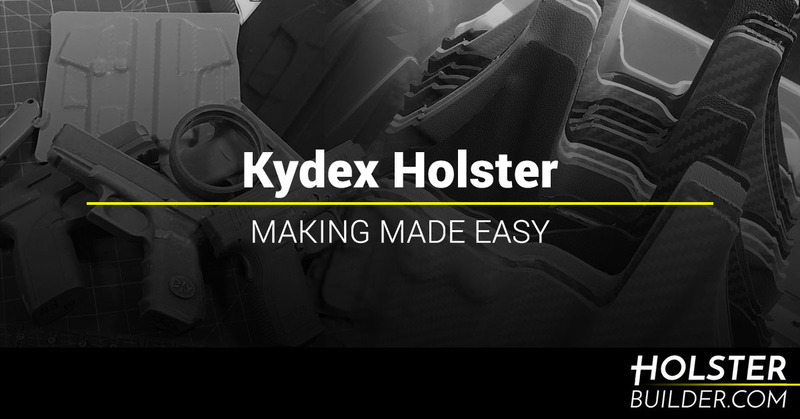 Whether you’re looking for kydex sheets for sale or you want to build a prototype for a new leather holster, we have everything you need to make it happen. With a combination of low prices, exceptional customer service, and affordable shipping, we’re here to make sure that the holster builders out there have the supplies they need. It’s as simple as that! Whether you are new to building holsters or you’ve been making them for years, we can help. For those who are new to the game, the key is to research, ask questions, and practice. We’ll be here for you, so don’t hesitate to contact us at any time because we were once in your shoes. We know just how difficult it can be to find the resources you need to craft the items you have planned out, but we’re proud to offer affordable options that allow you to create to your heart’s content. There’s a whole lot to take in and we can totally help you or direct you to other resources for you to learn from. We have the same passion as you do and we’d be glad to answer any questions you may have. Whether you put it in the notes during checkout or send us an email at [email protected], you should know that our goal is to help you succeed. No questions are off limits, because we know how tricky it can be to get started and just how overwhelming all of the options are. Take it from us, however, that once you get started, you’re sure to have the time of your life crafting items by hand. Can We Help You? Yes! Our goal is to inspire other holster makers and we’re passionate about doing it. At the end of the day, we’re in it together and we’d love to be a part of your story. That’s why each of the holster making supplies we offer is designed to help make your products the best of the best. You’re only limited by your creativity, so ask any questions, place an order, and get to work. It’s as simple as that! Is there more to it? Sure, but as the old saying goes, practice makes perfect. We started Eclipse Holsters five years ago and in that time we’ve seen a huge amount of growth. At Holster Builder, we believe that the more people who are making quality products, the better. People are always going to need holsters for their firearms and different people will inevitably have different needs. That’s why we’re so excited to support other holster makers out there whether they’re new to the game or they’ve been around for awhile now. Holster Builder is your one-stop shop for holster making supplies, so feel free to take a look around, reach out with any questions, or shop our inventory today. We’re here to help you and we want to see you succeed. Whether you need to buy kydex sheets, belt attachments, or something else entirely, you’re in the right spot.